The Master Blaster taught the world how to train and eat for maximum health and fitness. A personal remembrance of this one-of-a-kind fitness icon. Joe Weider passed away early Saturday morning, March 23, 2013, at age 93 in Los Angeles. He had been ill for some time, and the cause of his death was heart failure. Joe Weider's influence on bodybuilding and the fitness industry is so pervasive that it defies measurement. The websites we visit, the magazines we read, the contests we attend, the diets we follow, the workouts we undertake, the lexicon we use, the careers many of us pursue—they all exist in large measure because of Joe Weider. Things have changed now, but for generations, taking up fitness meant picking up one of Joe's magazines, buying one of Joe's weight sets for your garage, and purchasing some of Joe's supplements. In a moving tribute posted on his Facebook page, Arnold Schwarzenegger wrote, in part: "I knew about Joe Weider long before I met him—he was the godfather of fitness who told all of us to "Be Somebody with a Body." He taught us that through hard work and training we could all be champions." Joe certainly knew about overcoming odds to achieve greatness. His bio is no less remarkable for having been recounted many times. 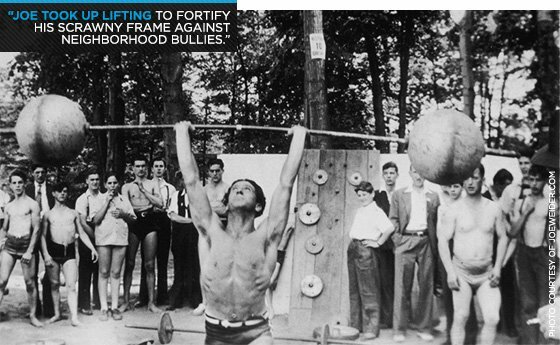 One of four children of Jewish-Polish immigrant parents, he grew up poor in Montreal, dropped out of school after seventh grade to help support his family, and took up lifting to fortify his scrawny frame against neighborhood bullies. He got his start in publishing working on what became Your Physique at his mother's kitchen table. 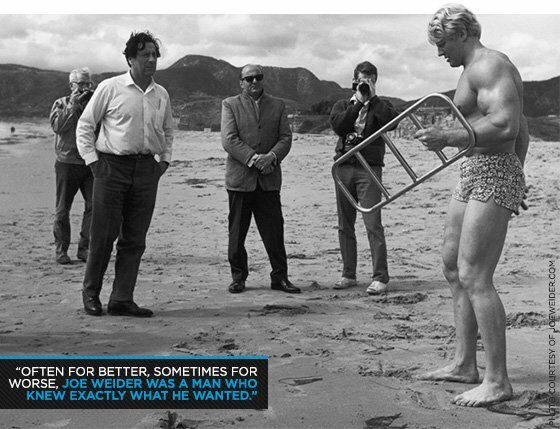 Joe Weider was a visionary. He championed fitness as a lifestyle when that seemed crazy to mainstream Americans, and he favored weight training and bodybuilding when it was considered little more than a cult. He thought working out and eating healthfully were the only things that could save us from a public health disaster. He was right then, and he's still right today. Joe Weider was an exercise scientist. He may not have held a degree, but his ceaseless experimentation produced an impressive body of work, including his Weider Principles. Whether they were invented by him, or merely packaged by him, no one cares now. They have helped millions find their way in the gym. Joe Weider was an entrepreneur. He started a fitness equipment company, a dietary supplement company, a global bodybuilding federation (along with his younger brother Ben), and, most notably, a publishing empire, one that he sold in 2003 to American Media for $350 million. Muscle & Fitness, M&F Hers, FLEX, Shape and Men's Fitness are all Joe Weider's brainchild, as were many magazines before them. Joe Weider was a marketing genius. He was selling a lifestyle, and he had a keen sense of his market. The aspirational physiques on the pages of his magazines offered a promise that would not only change your body, it would change your life, too. Self-confidence, health, vigor—Joe Weider figured out how to "bottle" them. Joe Weider was a missionary. He brought Arnold to America and spread the gospel of bodybuilding to the rest of the world. Along with Ben, Joe helped take the message of health-and-fitness to some 170 countries. Ben flew from continent to continent for more than half a century; Joe used the power of words and images. Although his accomplishments were epic, Joe the man was down to earth and modest. The famous marble bust with arms crossed didn't even depict his body. (Always the image sculptor, he borrowed Robby Robinson's chiseled torso and placed an image of his own head atop it). Joe, who spoke with a widely imitated French Canadian accent, could be cantankerous and mercurial, to the point where many of the editors, writers, art directors and photographers working on his beloved magazines would hide layouts in exasperation. Often for better, sometimes for worse, Joe Weider was a man who knew exactly what he wanted. It was all part of his grace and charm, and he was unflinchingly kind and supportive to those he encountered. So endearing was Joe's quiet presence that the Father of Bodybuilding became a surrogate or second father for many of the men and women under his charge, starting with Arnold. Later in my career, when I had a book published that is a quasi-memoir, I didn't think twice; I dedicated my life's story to date to Joe, a man who was, technically, only my former employer. But he was so much more than that to so many of us. This week, the muscle and mainstream media will pour forth tributes that echo his accomplishments and bolster his legacy, and they will all be heartfelt and richly deserved. Our site will be devoting coverage to the life of Joe Weider, celebrating his influence on bodybuilding as a sport and on fitness as a lifestyle. Please look for it on Bodybuilding.com starting tomorrow. We celebrate the passing of a truly great man, even as we are saddened that he has left us. But he leaves us with every tool that we need. So hit the gym today and crank out a workout in the Master Blaster's memory. Crush it. Rattle the plates so hard that he hears the racket upstairs. (Never mind when you hear, in a strange accent, "Nah, you're doing it all wrong. Here, let me show you...") He would love that, because that was his most powerful message of all: Work out. You'll feel better if you do.